Manual winding movement. 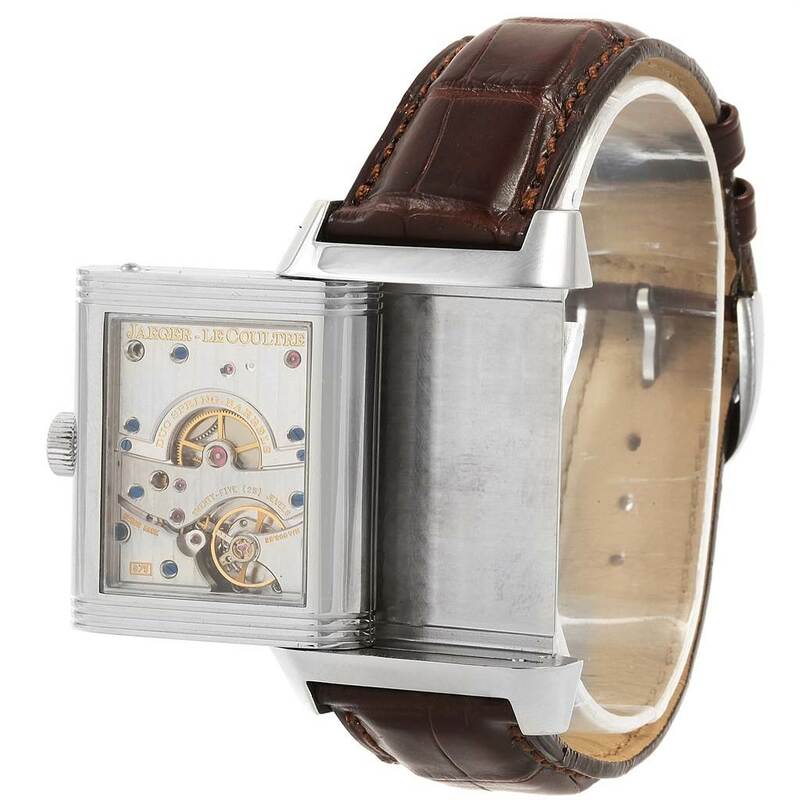 Rhodium-plated, fausses cotes decoration, straight line lever escapement, monometallic balance, shock-absorber, selfcompensating flat balance-spring, micrometer regulator, double spring-barrels. 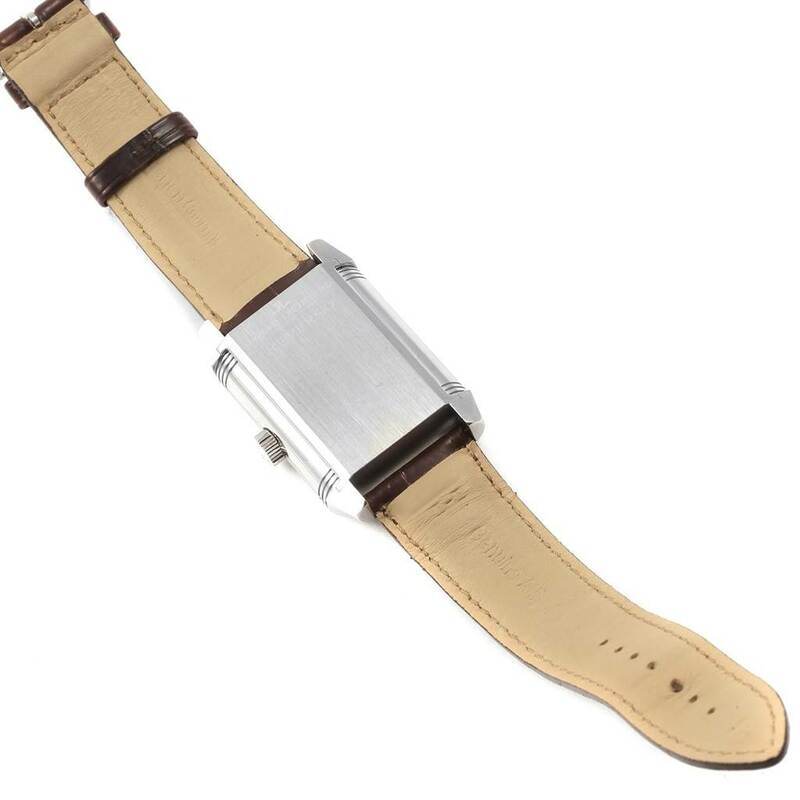 Stainless steel 47.0 x 29.0 mm rectangular case rotating within its back plate. Inner transparent case back. 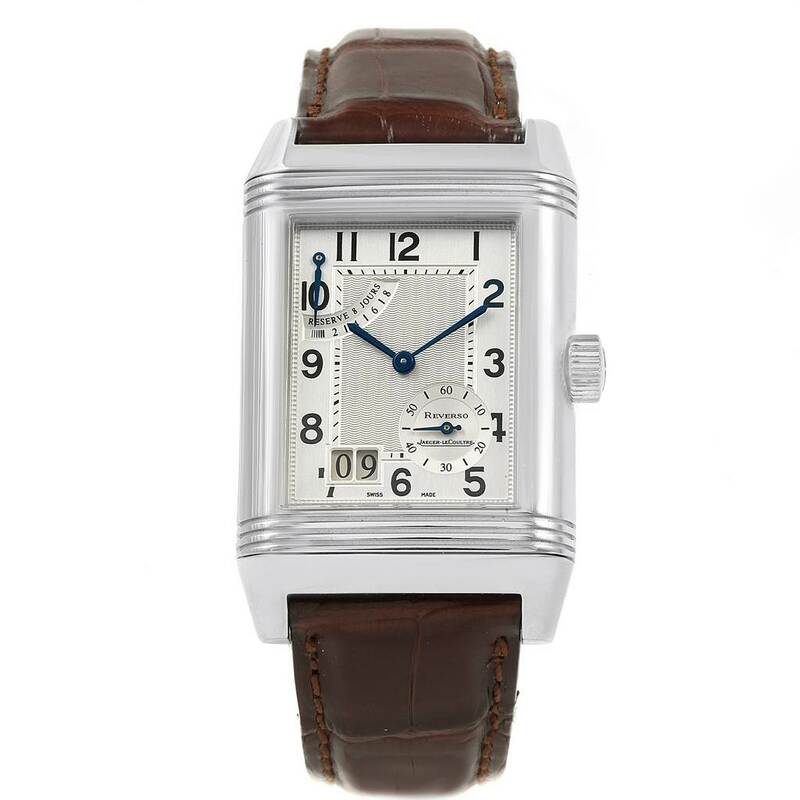 Fixed stainless steel reeded bezel. 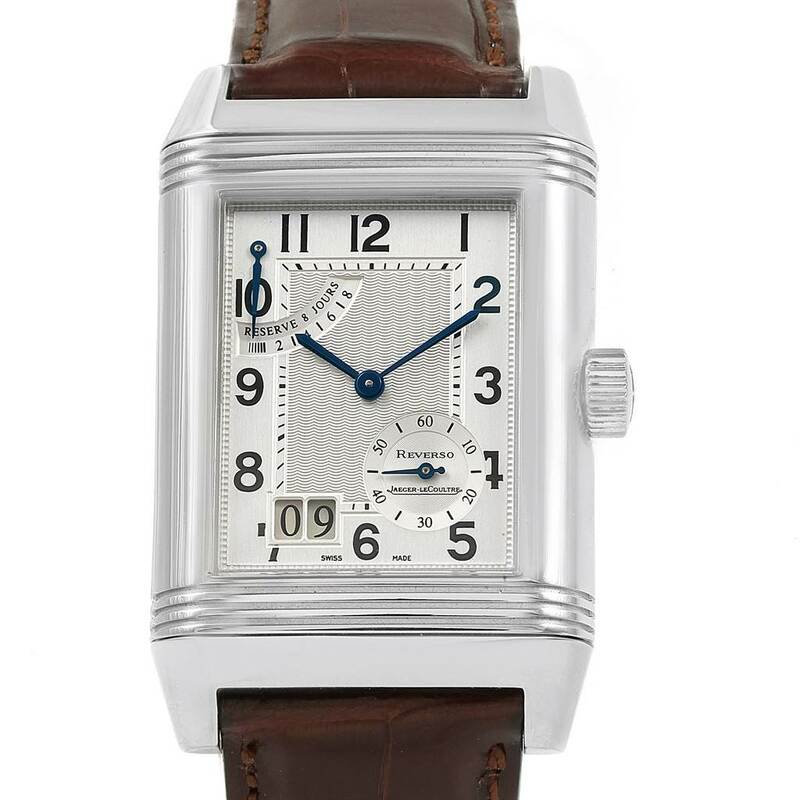 Guilloche silver with painted Arabic numerals on an outer plain reserve, guilloche subsidiary sunk seconds dial at 5, large double aperture for the date at 7, sector for the up-and-down indication at 11. Blued steel epee hands. 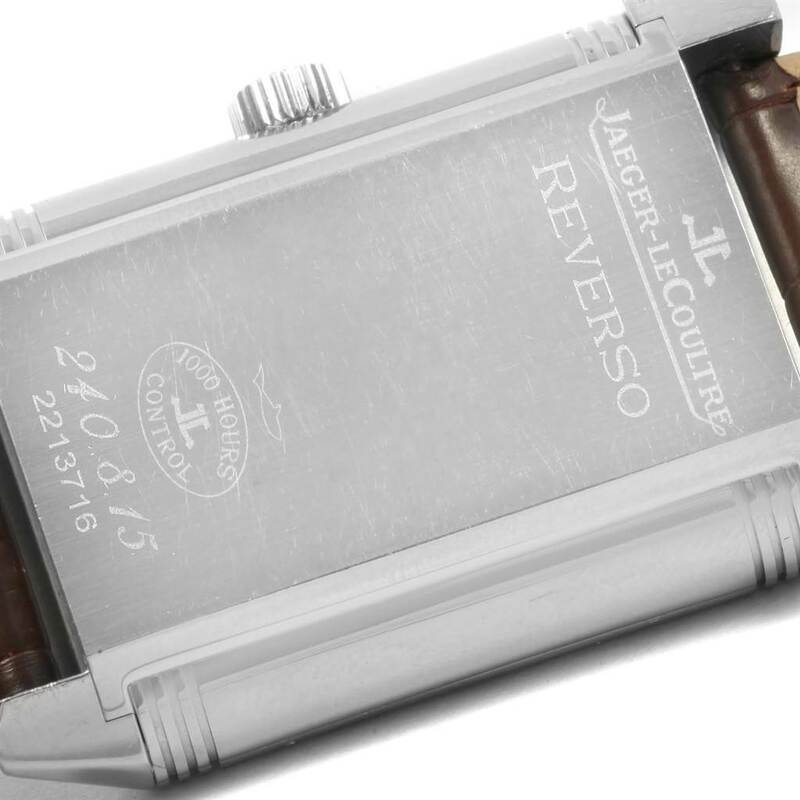 Jaeger LeCoultre Reverso XGT Grande Date 8 Day Mens Watch 240.8.15. Manual winding movement. 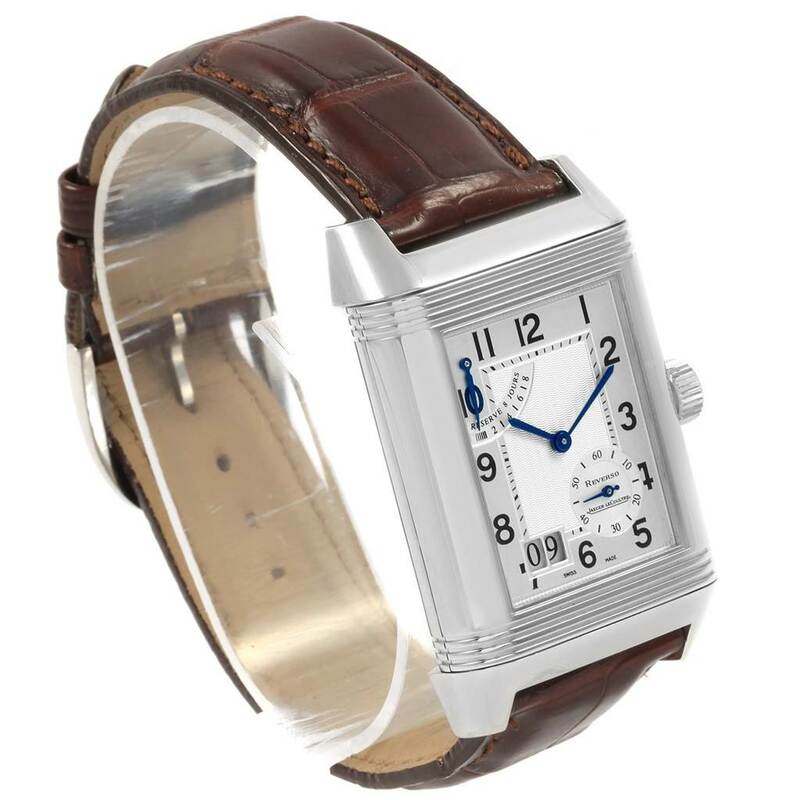 Rhodium-plated, fausses cotes decoration, straight line lever escapement, monometallic balance, shock-absorber, selfcompensating flat balance-spring, micrometer regulator, double spring-barrels. 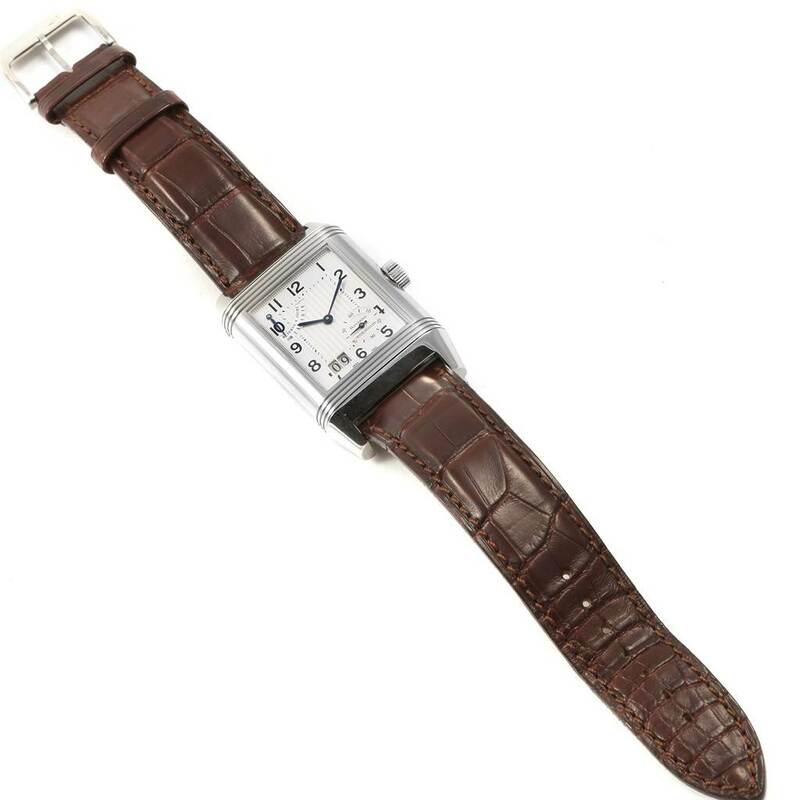 Stainless steel 47.0 x 29.0 mm rectangular case rotating within its back plate. Inner transparent case back. 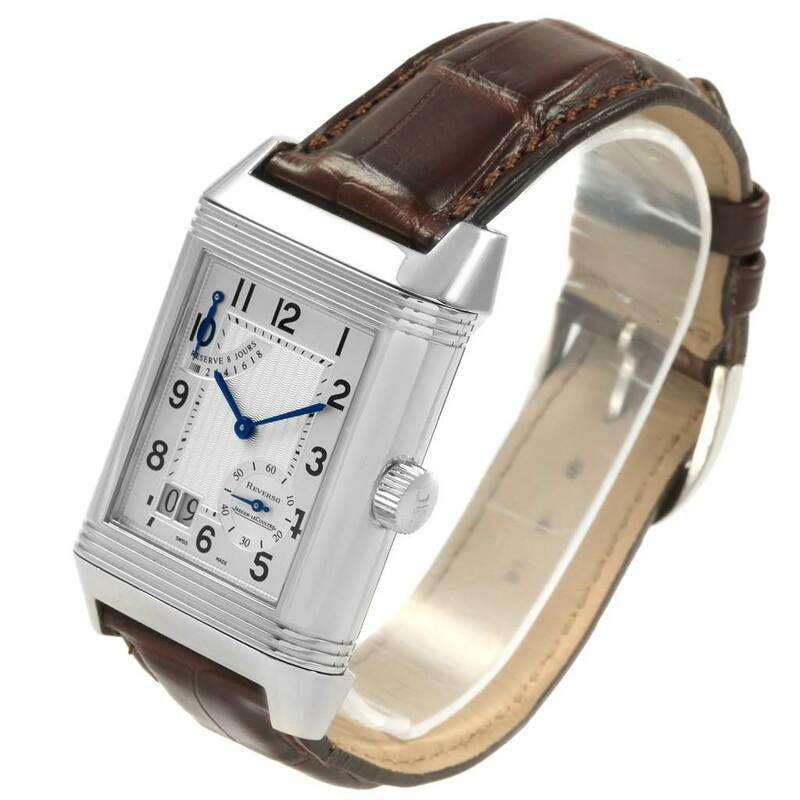 Fixed stainless steel reeded bezel. Scratch resistant sapphire crystal. 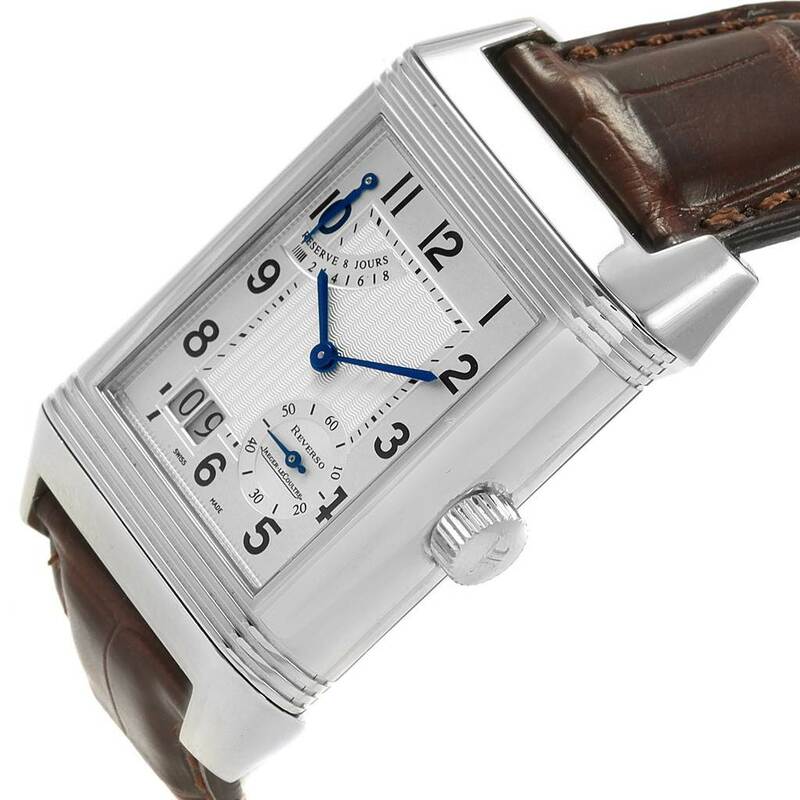 Guilloche silver with painted Arabic numerals on an outer plain reserve, guilloche subsidiary sunk seconds dial at 5, large double aperture for the date at 7, sector for the up-and-down indication at 11. Blued steel epee hands. 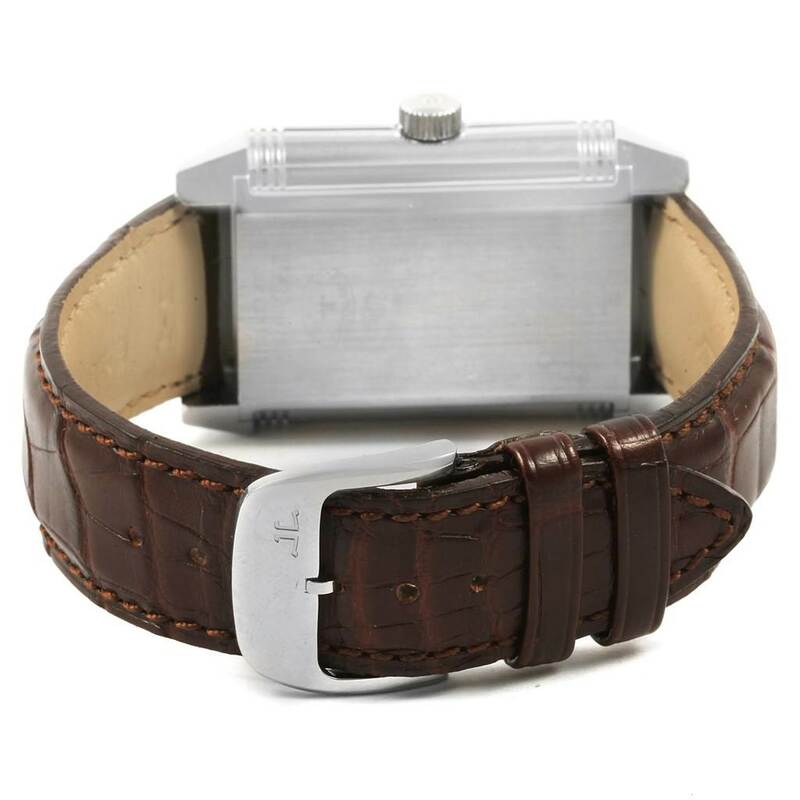 Brown leather strap with stainless steel tang buckle.